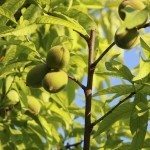 Why does my peach tree have thorns on it? Though many fruit trees do have thorns, Peach Trees are not one of them. I suspect you have growth from the root stock that may be from one of the stone fruit species that would have thorns. Commonly a hardy Cherry Tree root stock is used for Peach Tree grafting. Your tree has likely converted to the root stock, and the Peach portion of the tree may have died off. Is the tree growing from below or above the graft line? Here are some links with more information.